Greenstock brings together innovative ideas, creative design & quality manufacturing to supply faultless products at competitive rates. Greenstock in-connects combination of design capabilities, overmoulding and encapsulation experience together with electrical manufacturing abilities make us stand out from traditional subcontract suppliers, we don't just make your products, we add value. 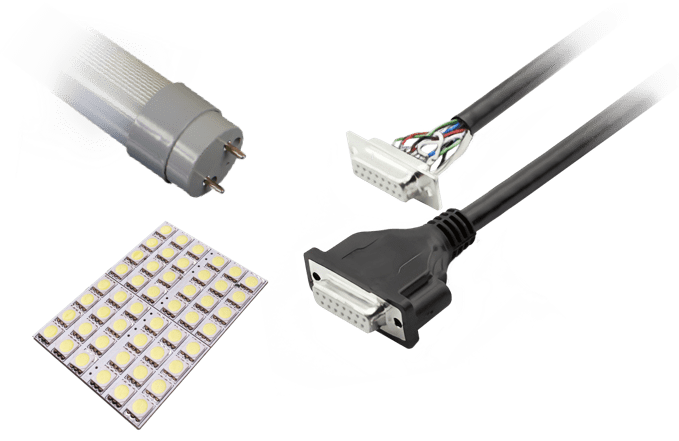 Greenstock Lighting provides creative & innovative lighting solutions for specific customer applications, with a focus on low voltage applications, customised lighting control features and the need for efficient product installation. Greenstock Shatterproof supply a wide range of protected lighting products for the food and beverage industry. With the highest possible level of protection against accidental glass contamination. Greenstock provides design, engineering, manufacturing and distribution, all under one roof with the experience to get your product right. Our staff partner with customers and suppliers and work with them to promote growth and expand capabilities, adding value in everything we do. Greenstock is committed to honesty, integrity, accountability and respect in everything we do, this demonstrated through our communication philosophy, our teamwork and our expertise. Always delivering quality, fostering creativity and paying attention to every detail. We strive for excellence in everything we do. Greenstock supplies products to a wide customer base including many blue chip OEM manufacturers in the healthcare, leisure and food sectors. We focus on providing innovative solutions to our customers, reducing cost, introducing leading edge solutions and advising best practice. Whatever your requirements our dedicated sales and engineering teams will work closely with you and make you stand out from the completion. Greenstock operates from a purpose built 12,000 sq. foot facility, based in Lincoln, at the heart of the East Midlands, with an excellent road and rail network providing easy access to our national, and international customer base. Greenstock has continued to extend its client base worldwide, and now exports to over 15 countries, with customers in the USA, Canada, Europe and Asia. Greenstock believes that inward investment is critical to the long term success of the business, with continual investment in people & equipment to develop and increase its capabilities. Please contact us to find out more. Our customers, employees and suppliers are all partners, we work with them to promote growth and expand our capabilities, adding value in everything we do. We believe in our staff, supporting them to achieve excellence. Greenstock is committed to honesty, integrity, accountability and respect in everything we do, this demonstrated through our communication philosophy, our teamwork and our expertise. Always delivering quality, fostering creativity and paying attention to every detail. We strive for excellence in everything we do. To add true value to our customers through the use of innovative ideas, creative design and quality manufacturing. Supplying a wide range of products on time, faultless at competitive rates.